New blood spot sampling guidelines - give us your views! The NHS Newborn Blood Spot screening programme screens babies for nine rare but serious conditions by taking blood from the baby’s heel using a special device. This sample is placed onto a blood spot card and sent to a lab for testing. Over the past few weeks we’ve been busy reviewing the guidelines for newborn blood spot sampling. 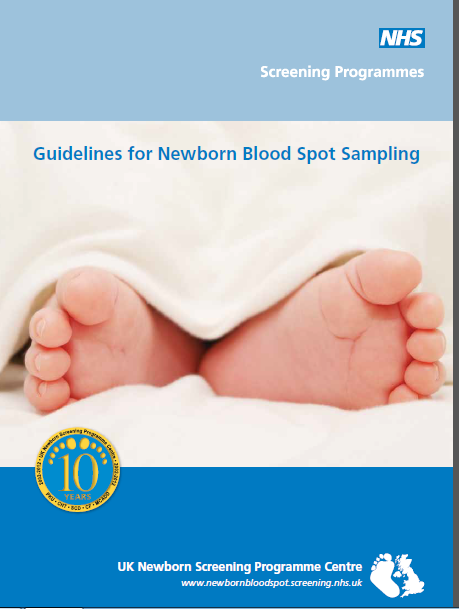 These guidelines, which were last updated in 2012, support the recommendation of blood spot screening to parents, the concept of informed choice and the collection of good quality samples. We asked colleagues from a range of services, including midwifery, neonatal and health visiting, to help us review the evidence, debate issues and suggest changes to the current guidelines. We’re now asking for your views on the updates – a consultation on the revised guidelines opens today for four weeks. We are emailing all our stakeholders a copy of the revised guidelines along with the link to the consultation survey. Please share these guidelines and link with people you work with – we’re interested in everyone’s thoughts! The updated guidelines support the recent drive to improve blood spot quality in England. This has included the introduction of a national laboratory agreement on assessing sample quality and a new online learning module for sample takers. The guidelines explain why blood spot quality is important and the reasons why samples might be rejected by the lab. The introduction section now has more information on what might happen if a baby with a condition isn’t screened and treated early. We’ve also suggested updates to the section on declined screening, including giving a letter to parents who choose not to have their baby screened. Other updates include more information on blood transfusions and the congenital hypothyroidism preterm policy to help make these clear. We will publish a summary of the consultation responses and get in touch with everyone when the final version is ready (probably towards the end of the year). PHE Screening BLOGs provide up to date news from all NHS Screening programmes– replacing our previously published newsletters.